Twenty-one new student members were inducted in the Paulding High School National Honor Society on March 31st. Congratulations to these students! FFA Equine team Riley Noffsinger, Jordan Merriman, Jen Stahl and Lonna Saylor place 4th out of 118 teams which qualifies them to compete at state finals! Please click on 'Read more' for the rest of the results. Congratulations to Claire Schweller, Ember Helms-Keezer, and Paige Jones who received Excellent ratings at the district Science Fair at ONU. Paige also won a special award from the Western Land Conservation group for her work with the worm types and plant growth. Paulding Elementary cafeteria ladies made 'Green Eggs and Ham' on Monday, March 4, to celebrate Dr. Seuss's birthday, which was March 2. Click here for more pictures! The Paulding High School Engineering team participated in the TEAMS/JETS engineering competition at Ohio Northern University. The 9-10th grade team placed 3rd. Several FCCLA students completed their Career Development Event Chapter Service Projects and competed at the Regional level at Upper Valley Career Center in Piqua. The Paulding FFA would like to congratulate Courtney Luderman on her FFA proficiency awards. The Paulding FFA Chapter sent 6 Officers to the Huntington Leadership Summit at Huntington College. On February 18th the Ag Sales team made up of Jonathan Reinhard, Courtney Luderman, Shannon Hale and Riley Noffsinger competed in the district contest held at Spencerville. The Paulding FFA chapter had seven members compete in sub-district public speaking at Delphos on February 13th. Students in the creed speaking contest had to memorize the FFA Creed by E.M Tiffany and answer questions about the creed. The Paulding FFA had four members compete at State in Columbus for Ag Communications. The team consists of Paige Jones, Jen Stahl, Kalyn Strahley, and Shannon Hale. The PHS Science Fair was held on February 15, in the auditeria. The following ratings were given: GOOD-Kyle Kelly, Brody Fisher, Grady Vogel; EXCELLENT-Taelyn Etzler, Gabby Casper, Sam Woods, Caleb Thompson, Lily Roehrig, Janae Pease, Alivya Bakle, Audrey Giesige; and SUPERIOR-Paige Jones, Ember Helms-Keezer, Claire Schweller. Paige, Ember and Claire will represent PHS at the District Sci­ence fair at ONU on March 16. Good luck! Click on 'read more' for pictures. All Jr. High practices and games are cancelled today. The girls varsity basketball game vs Defiance is still on as is the boys freshman basketball game with Allen East. The redistricing meeting at Oakwood Elementary is still on as scheduled. Congratulations to Paulding 7th grader Sarah Wong who won the Paulding County Spelling Bee by correctly spelling 'galleria'! Sarah will compete in the Regional Competition on March 9 at 10:00 AM at PFW Rhinehart Recital Hall in Fort Wayne. PEVS honored all branches of the military at the beginning of the Varsity Boys Basketball game against Delphos Jefferson Friday, January 18, 2019. Dan Wilder, retired Air Force Veteran, sang the Star Spangled Banner. School will be in session after the 2 hour delay today, Monday, January 14, 2019. The results of the Middle School Spelling Bee are as follows: L-R Haley Manz, 5th place; Carla Manz, 3rd place; Sarah Wong, 1st place; Kurtis Bauer, 2nd place; and Hannah Arnold, 4th place. Sarah will compete at the County Spelling Bee on February 5 at Payne Elementary. Congratulations to all of these students! The PHS Band participated in the Wreaths Across America cermony held at St. Paul Cemetary and Cooper-Haines Cemetary in Paulding Township on December 15. 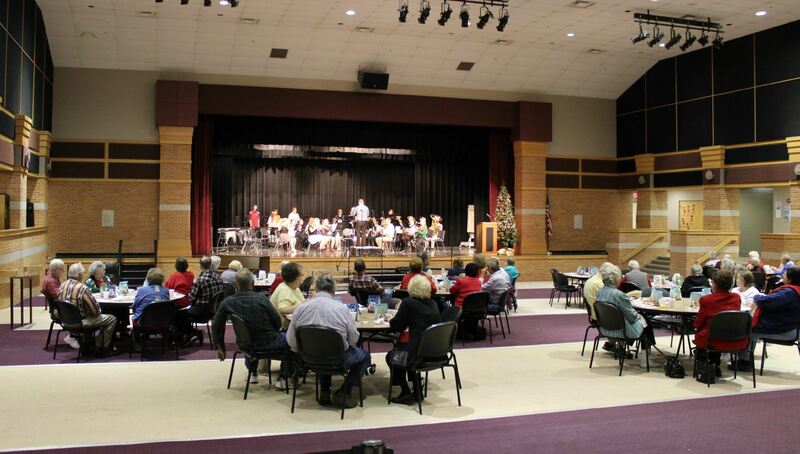 The 22nd Annual Senior Citizen's Breakfast was held on December 10. Our guests were served breakfast and entertained with songs and music by the Paulding 4th graders, Oakwood 3rd and 4th grade Choir, 7th grade Band, 7th and 8th grade Choir, HS A Capella group, HS Band, HS Choir and the HS Jazz Band. Luke McCullough was the MC and the meals were served by the NHS and Student Council students. Thank you all for coming! We hope you enjoyed it! Click here for more pictures. PHS Athletes traveled to Oakwood Elementary to promote 'Reading is a Sport' to the students. If students read a certain number of minutes (each grade level has different goals), they get a free pass to a Varsity Boys Basketball game and special recognition at the game. While visiting Oakwood the Athletes found an Elf on the Shelf! The seventh grade students have been participating in a service learning project for the past 3 months. They collected items that will be donated for care packages for soldiers through Operation Gratitude. As the project wrapped up today, the 7th grade students collected a total of 1866 items. Awesome job 7th grade students! PEVS wishes everyone a Happy Thanksgiving! School will not be in session November 21-26. Classes resume on Tuesday, November 27. The Paulding FFA Chapter sent five FFA Officers to the Ohio Legislative Leadership Conference (OLLC) in Columbus Ohio on the 26th of September. Congratulations to PEVS Bus Driver Jerrolyn Parrett, who was named the 2018 Grand Marshall of the Oakwood Homecoming Parade! The Paulding FFA chapter had a busy weekend on Labor Day. The chapter helped with Oakwood Homecoming. They ran the kiddie tractor pulls, had a food stand at the tractor pulls, and they made a float for the Oakwood Parade. PHS and the PHS Athletic Department are hosting a Drive 4 UR School with Integrity Ford of Paulding on Friday, September 7 from 10:00 am to 5:00 pm. Ford Motor Company will donate $20 to PHS for every test drive. Please click here for details. PEVS would like to welcome 7 new teachers to the staff for the 2018-2019 school year. Laptops are ready for pickup for high school students. If your student plans to take the device home, you are required to pay the annual insurance premium. We have a new process this year for signing laptop agreements. We ask that each family sign up for Final Forms and complete the laptop agreement forms electronically. To save time and to insure that your device is ready upon pickup, please schedule a pickup date and complete the online agreement forms with Final Forms prior to picking up your student’s laptop. If you are unable to create an account or have issues completing the forms, we can assist you in the High School Auditeria during pickup hours. For further instructions and to view pickup dates/times, please see the link below. The FFA Greenhouse class is having a Plant Sale! Times are listed below for the public. The Greenhouse is located on Caroline St on the south side of the school. The Paulding FFA Officer team traveled to Peebles, Ohio on Monday, August 6th for their annual FFA Officer retreat. Paulding Middle School 8th grade teachers held their annual Career Day on Friday, May 4. Community members from different fields of expertise came in to share information about their careers with students in order to get a head start on what they may want to do in their future. Pictured is Paulding County Juvenile and Probate Judge Michael Wehrkamp sharing information about law with 8th grade students. Click on 'Read more' for more pictures. Four members from the Paulding FFA Chapter and 2 members from the Wayne Trace FFA traveled to Washington D.C with FFA advisor and teacher Staci Miller for the FFA Washington Leadership Conference. While there they visited with Congressman Bob Latta on the Capitol steps. Pictured here from left to right Alli Hefner, Haleigh Stoller from Wayne Trace, Bob Latta, Jen Stahl, Miah Rue, Shannon Hale, not pictured Kaylie Tressler from Paulding FFA. The Paulding HS Science Olympiad team competed at the State Science Olympiad tournament on Saturday, April 28th at OSU in Columbus. Only the top 40 teams in the state of Ohio qualified to participate at this competition. Charles Clapsaddle and Brian Matson are the State Silver Medalists in the event "Game On," which involved coding a computer game in less than an hour. Congratulations to the whole team for their endeavors. Senior Cassidy Posey (center) has signed a letter of intent to attend Defiance College and play volleyball. Joining Cassidy at the signing are her parents, Stephany and Don Foltz, and Cheri Estle, PHS Head Volleyball Coach. Good luck Cassidy! Students who are interested in taking College Credit Plus classes during the 2018-2019 school year must have their ‘intent to participate’ forms turned in to the guidance office by Thursday, March 29. Forms can be picked up in the guidance office. The Paulding FFA held their annual Petting zoo on April 6. Students and staff from Paulding Elementary through High School had the opportuinity to see, pet and ask questions about large and small animals (pony, donkey, calf, dogs, rabbits, ducklings, chickens, goats, and pigs). Thank you to the families and students that brought in their animals for the day. Click on 'Read more' for more pictures. The 6th grade Battle of the Books team from Paulding Middle School, took 1st place at the County competition on March 28. Members include (L-R): Trinity Salazar, Casey Agler, Malia Manz, Carla Manz, Maci Kauser, and Ella Gorrell. Not pictured - Tytus Manz. County teams were represented from Paulding, Oakwood, Payne, Antwerp, Grover Hill, and Divine Mercy. Congratulations! With the cancellation of school on March 21, we will be using Thursday, March 29, as our first make-up day. School will be in session on March 29. Congratulations to Megan Harpel and Sydney Reineck who each received an Excellent rating at the Ohio Northern University District Science Fair! Paulding High School Drama Department is happy to present ‘The Wizard of Oz’. After a tornado whisks Dorothy away to the magical land of Oz, young Dorothy Gale, played by senior Abby English teams up with a Scarecrow, (Senior, Brian Matson) a Tin Woodsman, (Junior, Lexie Beckman) and a Cowardly Lion (Senior, Kalen Kelly) to find the mighty Wizard of Oz, (Sophomore, Colin Lilly) who can send her home. Along the way, they must avoid the clutches of the Wicked Witch of the West, (Senior Jacee Harwell) who is trying to steal the mysterious magic slippers that once belonged to her evil sister... but are now on Dorothy's feet. Dorothy eventually learns just how magical friendship can be and how wonderful it can feel to go home again. Come join us to see this great performance on March 23 and 24 at 7:00 p.m. and March 25 at 3:00pm in the High School Auditeria. Presale tickets will be sold the week of March 19 in the high school office for $8. All tickets at the door will be $10. Doors will open at 6:30 p.m. for hors d’oeuvres on Friday and Saturday, 2:30 p.m on Sunday. 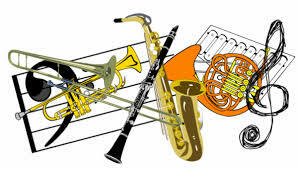 Music of the Night, the annual fundraiser for the Paulding Bands, will be held on Saturday, April 21, with the doors opening at 5:30 p.m. The theme this year is, "Exploring the 4th Dimension", featuring music from Star Wars, Back to the Future, Star Trek, Doctor Who, and more! Dinner from Grant's Catering will be served at 6:00 p.m. and entertainment by the Middle and High School Bands will begin at 7:00 p.m. A silent auction, 50/50 raffle and a $5 raffle for a FREE week in the Domincan Republic, will also be held. Please click here for a reservation form, due by April 9, 2018. District Science Fair Winners: Gabbi Stallbaum, Sheriden Matty, Molly Adams. Gabbi received a superior and a special award from Mercy College, Sheriden received an excellent and a special award from the University of Toledo Chemistry department, and Molly received a superior and a special award from the Ohio Soybean council. Not pictured is Carmen Reno who received an excellent. The Ag Sales team, consisting of Abbie McMichael, Kalyn Strahley, Jen Stahl and Jonathan Reinhard, placed 2nd in District competition and qualified for State on March 3rd. Kalyn placed 2nd individually, with all team members placing in the top 10. Good luck! As of February 9, 2018, PEVS has had six calamity days. The scheduled make-up day of Monday, February 19, will now be used as a Professional Development Day for STAFF ONLY. Students will not be in session on February 19. Also, school will not be in session on Friday, February 16, due to Parent/Teacher Conferences. Paulding High School will once again be hosting the OHSAA Gilrs & Boys Divisions IV Sectional Tournament and the Girls Division II District Tournament. The schedule is as follows or click on 'Read more' for detailed schedule. The Paulding FFA Ag Communication Team competed at the district contest on Wednesday and placed 1st. The team is made up of Sydney Reineck, Shannon Hale, Kalyn Strahley and Jen Stahl. This qualifies them for the State Contest on Feb 10th. Great job girls. Oakwood Elementary held their annual Spelling Bee on Friday, January 5, with forty-one 5th and 6th grade participants. After several rounds, Jamy Hunt (left) correctly spelled 'barrette' to become this year's Spelling Bee Champion. We had two Spelling Bee Runners' Up, Royce Cooper (middle) and Victoria Quiroz (right) both misspelled a word in the same round. Congratulations, Jamy!! Great job Royce and Victoria!! Congratulations to Luke Beckman (middle), who won the Paudling Elementary Spelling Bee. Runners up were Cully Thompson (right) and Josiah Akom (left). Luke will compete in the County Bee in Antwerp on February 6th. Good luck! Congratulations to Sara Wong (left), who was the Middle School Spelling Bee Champion and to Haley Manz (right), who was runner up. Sara will compete in the County Spelling Bee in Antwerp on February 6. Good luck Sarah! The Special Olympics Basketball Tournament scheduled for Saturday, January 6, has been cancelled due to the cold temperatures predicted. Congratulations to Mrs. Harder's Ohio Model United Nations students for their accomplishments throughout their Model UN competition. Jocelyn Camposano served as Vice President of International Court C and represented PHS with great honor and pride. Sophomore Katie Strayer and Junior Hailey McDaniel both received an Outstanding Leadership Award. PHS received a first runner-up trophy for Outstanding Service raising funds for the I-OPEN project. Thank you to those who came to the 21st Annual Senior Citizen's Breakfast on Wednesday, December 6. Students from Oakwood Elementary, Paulding Elementary, Middle School and High School entertained the guests with singing and playing instruments while breakfast was served. We appreciate the support from our district residents and look forward to hosting the event agian next year! Paulding Exempted Village School District is hereby giving notice that sealed bids for the Phase III 2018 Storefront Entrance Replacement Project at Paulding High School, Paulding Middle School and Paulding Elementary, 405 N. Water St., Paulding, OH 45879, will be accepted until 12:00 noon on December 13, 2017, at the Administration Office. The Ohio Dental Association, in conjunction with the Dental Center of Northwest Ohio, will be honoring ‘Give Kids a Smile Day’ by providing FREE dental services for kids un­der the age of 18, on February 2, 2018. If you are interested in signing your child up for free dental services, please complete this form or call Beth Stoller, the school nurse, at 419-399-4656 ext. 1315 to request a form. The deadline to register is January January 19, 2018. NOTICE: The date of the December Board of Education meeting has been changed from December 19 to December 12, at 7:00 p.m. The start time for the Paulding vs Antwerp Boys Basketball Triple-header game on Saturday, December 2nd, (at Paulding), has been changed to 2:30 p.m. The Freshman game will begin at 2:30 and the JV and Varsity games will follow. The Food Science team placed first at the District Food Science competition! PHS Drama Dept. will be performing ‘Murder’s in the Heir’, an Audience Interactive Murder Mystery-Comedy, on November 17 and 18 in the High School Auditeria at 7:30 p.m. both nights. Doors will open at 7:00p.m. Tickets will go on sale the week of November 13th in the High school office. Pre-sale tickets will be $5 and all tickets at the door will be $7. A Professional Development Day has been scheduled for Monday, November 27, 2017, therefore school will not be in session for students. Congratulations to our FFA Poultry Judging Team, consisting of Estee Miller, Kalyn Strahley, Hannah Farr and Chantel Monnier, who won 1st PLACE OVERALL at the 'Big E', a National competition held in Massachusetts! Also, individually, Hannah placed 1st, Kalyn 2nd, Chantal 5th and Estee 6th! Congratulations to the Paulding FFA Poultry Team who will compete at the Eastern State Exposition (Big E), a National Competition September 15-17 in West Springfield, MA. We would like to wish the Poultry Team made up of Hannah Farr, Chantal Monnier, Estee Miller and Kalyn Strahley the best of luck as they represent the Paulding FFA Chapter at this National Contest! Please welcome our new 2017-2018 PEVS teaching staff! Front row L-R: Chelsea Koester-HS Guidance, Emily Remaklus-HS English, Alicia Koester-MS ELA, Tina Grimes-Elementary Tech, Heather Eubank-HS English. Back row L-R: Sam Laderach-HS Math, Garrett Davis-HS Science, Kent Smelser-Oakwood Phys Ed, Matthew Warnecke-Paulding 5th Grade, Shawn Hurd-Paulding 4th Grade. Starting next week the technology department will have laptops ready for pickup for those that plan to pay for the Laptop Protection Fund. Pickup dates will be Tuesday, August, 8th and Thursday, August, 10th from 9 AM to 3 PM. Please stop in the high school office. You will also need to fill out the necessary forms to be eligible to take the device home. Please click here to download/print those forms. These will also be available in the office. The 3rd Annual Paulding Athletic Boosters 4 Person Golf Scramble will be Sunday, September 24, beginning at 1:00 p.m. at Auglaize Golf Course. Click here for more details. The Paulding Exempted Village Schools Board of Education will be holding Special Board Meeting on June 14, 2017, at 4:30 P.M. in the Administration Office for the purpose of interviewing candidates for Treasurer and any other business that may come before the board. The meeting will be held in Executive Session. Paulding Elementary Teachers and Staff lined up to wave good bye to the students on their last day! The Paulding Exempted Village Schools Board of Education will be holding a Special Board meeting on May 31 and June 1, 2017 at 5:00 p.m. in the Administration Office for the purpose of interviewing candidates for Treasurer and Superintendent. The interviews will be held in Executive Session. Softball Camp for students currently in grades K-6 will be held on June 1-2. Please click here for the registration form. Deadline to register is May 23. Football and Basketball Camp for students in grades 1-6 this upcoming school year will be held June 20th - 22nd. Click here for the registration form. Please see the Athletic Tab for more information on Athletic Hall of Fame nominations. Deadline is May 31, 2017. Paulding Exempted Village Schools is hereby giving notice that sealed bids for the 2017 Window Replacement Project at Paulding High School and Paulding Elementary School, 405 N. Water St., Paulding, OH 45879, will be accepted until 12:00 Noon on March 7, 2017, at the Paulding Exempted Village School District, 405 N. Water St., Paulding, OH. A set of project documents may be obtained from the Paulding Exempted Village School District Office at 405 N. Water St., Paulding, OH 45879. The Board reserves the right to accept any part or all of any bid and to reject any and all or parts of any and all bids. Paulding 8th grade team, #PantherSquad will be participateing in a service project to support 'Sole Hope'. Please click on 'Read More'. Some of the PHS student athletes visited Oakwood Elementary for a Pep Assembly with the students on January 20. There will be a mandatory College Credit Plus meeting for the 2017-2018 school year on Monday, February 6th at 6:00 pm in the Auditeria. Any student entering grades 7-12 next year that is interested in participating in the College Credit Plus program must attend the meeting with a parent/guardian. Any questions may be directed to the High School Guidance office at 419-399-4656 ext 1131. A Special Board Meeting will be held on Wednesday, January 25, 2017, beginning at 6:00 p.m. The purpose of the meeting is to hold an executive session to consider the investigation of charges or complaints against a public employee, official, licensee, or student, to consider the discipline of a public employee or official, to consider the employment and/or dismissal of public employees or officials, and to consider matters required to be kept confidential by federal law or regulations or state statues. This Friday, January 20, is Military Appreciation Night at the Varsity Boys Basketball game versus Bluffton. All current and veteran military will receive free admission, a voucher for a free popcorn, and will also be honored prior to the colors being presented. The JV game begins at 6:00 p.m. Please click here for more information. 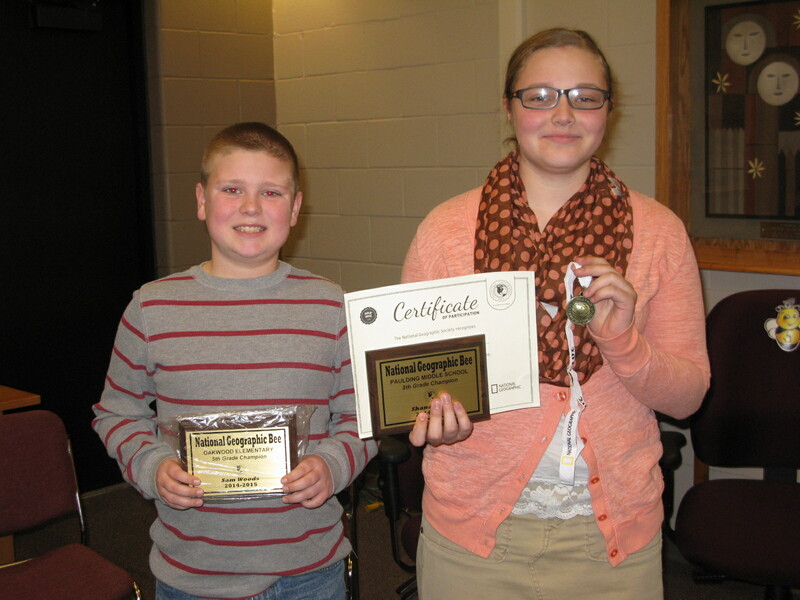 Geography Bee Winner Sam Adams (right), and Runner Up Ashton Manz (left). 8th Grader Caleb Manz was the Spelling Bee winner at Paulding Middle School and will compete in the County Spelling Bee on January 30, held at Paulding Middle School. The winning word was "vengeance". Second runner up was Haley Manz, 6th grader. Paulding Preschoolers visited The Gardens on the Preschool Family Day and played some planned activities with the residents. Many guests were entertained by the High School and Middle School Band and Choir at their Christmas concert held on Sunday, December 18. Click on 'Read More' to see pictures. Lexie Beckman and Jacee Harwell received Oustanding Leadership Awards at the State OMUN (Ohio Model United Nations) Competition in Columbus. The 20th Annual Senior Citizen's Breakfast was held on December 7th. The guests were entertained by the Oakwood 5th & 6th grade choir, Paulding 3rd graders, Paulding Middle and High School choirs, High School band and Cade McGarvey on the piano. Click on 'Read more' to see more pictures. A public hearing will be held at the regular Board of Education meeting on December 13, 2016, on the school calendar, required per R.C. 3313.48(B), including a presentation by Superintendent William Hanak on the total number of hours in the school year, length of school day, and start and end dates of instruction in the 2017-2018 calendar. The meeting will begin at 6:00 p.m. in executive session (see notice on this page below). The Ohio Dental Association, in conjunction with the Dental Center of Northwest Ohio, will be honoring ‘Give Kids a Smile Day’ by providing FREE dental services for kids under the age of 18, on February 3, 2017. The Northwest Conference Quiz Bowl competition was held at Paulding on November 12, 2016. Paulding's JV team finished in 1st place and the Varsity team finished 2nd. Congratulations! The PEVS Board of Education meeting on December 13 will start at 6:00 p.m. in Executive Session to discuss details relative to the security arrangements and emergency response protocols for the board of education. The executive session is estimated to last one hour and the regular meeting will start at 7:00 p.m.
Congrats to our FFA Food Science Team who placed 1st at the district competition and will advance on to the state competition in Columbus on December 3. Team members are Chantal Monnier, Estee Miller, Hannah Farr, and Kalyn Strahley. Individually, Chantal placed 1st, Estee placed 2nd and Hannah placed 4th!! Good Luck to junior Ethan Dominique who will be participating in the District Golf Tournament at Red Hawk Golf Course on Findlay, OH on Thursday, October 6. The PHS Volleyball teams will be hosting the Hicksville Aces for thier annual 'Volley for a Cure'pink game on October 3. The games will start at 4:30 with the Freshman teams playing first. Anyone that wears a 'Volley for a Cure' shirt will get free admission into the game. A bake sale will be held and free will donations will also be accepted. All donations will go towards cancer research. A 'Parent Austism Night' will be held on September 27 at 6:00 p.m. in the High School Media Center. Please click here for more information. NOTICE: A Special Board Meeting will be held on Monday, August 15, 2016 at 3:30 p.m., in the Administration Board Room. The purpose of the meeting is to consider the empoloyment and compensation of public employees or officials. 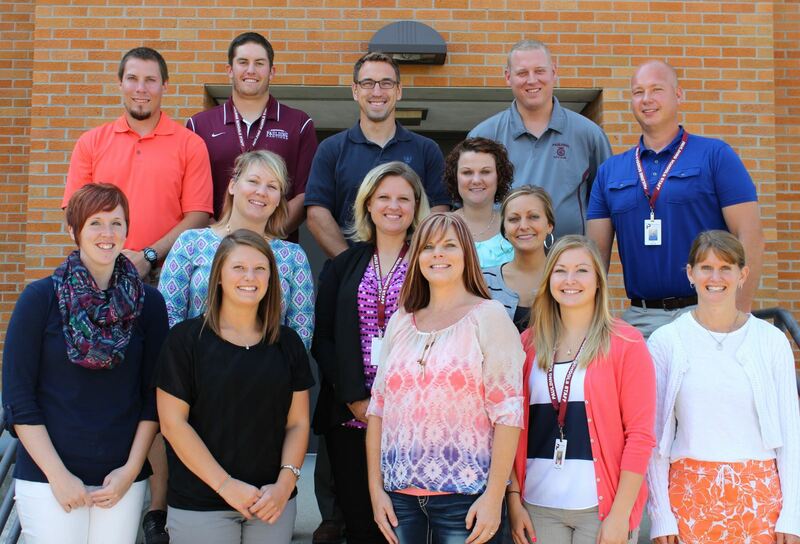 Welcome to our new staff to Paulding Exempted Village Schools! A Public Hearing will be held on August 8, 2016, from 3:30-4:30 p.m. in the Administration Board room for input on our IDEA Part B Funds. The Boys Freshman Basketball game vs Allen East scheduled for today, 1/7/16, has been cancelled. School is running on schedule today, Wednesday, November 11. NO DELAY as stated on WANE TV 15. A Parent - Professional Training titled 'Understanding AD/HD' will be held Thursday, September 24, 2015 at Antwerp Local Schools. Please click on here for more information. The JV Baseball game at Delphos Jefferson today has been cancelled due to field conditions. A public hearing on the school calendar, required per R.C. 3313.48(B), including a presentation by Superintendent Hanak on the total number of hours in the school year, length of school day, and beginning and end of dates of instruction in the calendar for 2015-2016 will be held on Tuesday, April 21 at the regular school board meeting. The meeting begins at 7:00 p.m. and will be held in the Oakwood Elementary cafeteria. The Girls Varsity Softball game at Antwerp on Saturday, April 11, has been moved to Paulding. Start time is 11:00 a.m.
PEVS will be in session on MONDAY, February 16, 2015 (President's Day). This will be the first make up day. The College Credit Plus Meeting has been rescheduled for 6:00 p.m. Thursday, February 12, in the HS Media Center. The Financial Aid night that was scheduled for today, has been rescheduled for Thursday, January 15, at 6:00 p.m. The 2015 Athletic Hall of Fame ceremony will take place on Saturday, January 24, between the JV and Varstiy Boys Basetball game vs Ayersville. The JV game begins at 6:00p.m. Classes will resume on Janurary 5, 2015. The Paulding Exempted Village Schools Board of Education will hold a Special Meeting on Wednesday, October 29 at 5:00 pm at the Paulding Administration Office, for the purpose of approving union employment contracts, and for the purchase and sale of land. 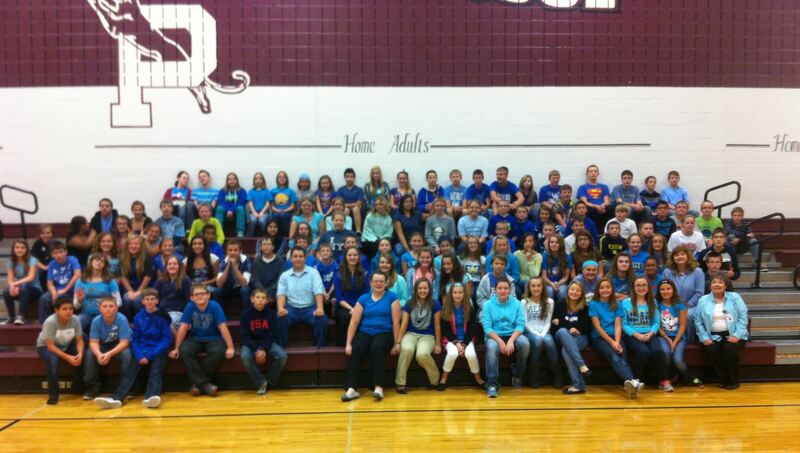 Paulding Middle School students participated in Bullying Prevention World Day on October 6, 2014 by wearing something BLUE to school. World Bullying Prevention Day is sponsored by STOMPOUTBULLYING.ORG . The students were encouraged to wear the color blue to show their support and also take part in random acts of kindness, complimenting others, lending a helping hand, and even just smiling at someone new. 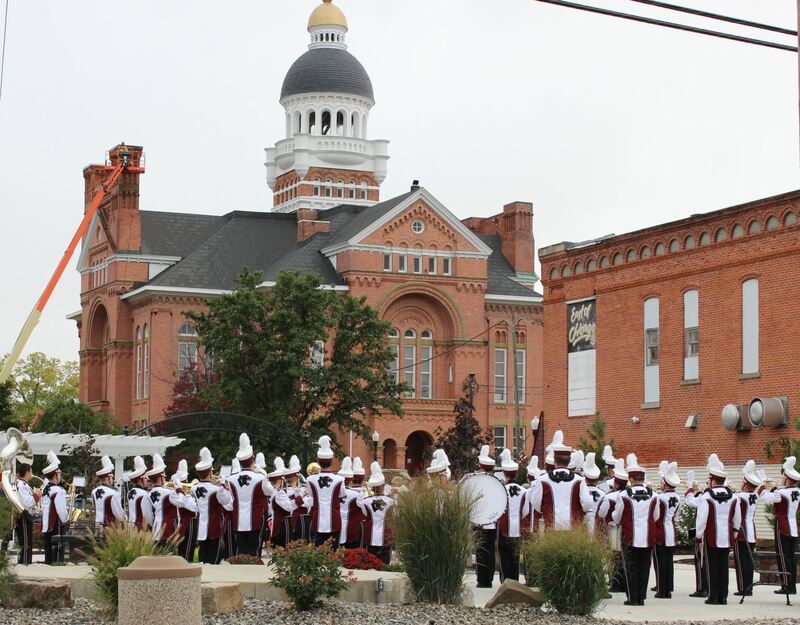 The PHS Marching Band performed at the Herb Monroe Park dedication on September 30. See the High School Page for more pictures. If any student cannot come at the scheduled time, or would like to come with a sibling, they can come anytime from 8:00-11:00 a.m. or 12:30-3:00 p.m. Retiring staff members were recently honored at a staff appreciation breakfast. Varsity Track Meet cancelled. Practice inside after school. Varsity Softball game cancelled. No practice today. JV Softball game cancelled. No practice today. Congratulations to our FCCLA members who recently attended the FCCLA Regional Rally competetion. See the next page for results and pictures! The PHS Drama Department will be presenting "The Beverly Hillbillies" this weekend, March 21 and March 22, in the auditeria. The curtain will open at 7:30 p.m. both nights. Presale tickets may be purchased in the High School office this week for $5.00. All tickets at the door will be $8.00. PEVS will be operating on a 2 hour delay, Thursday, March 13, 2014 due to the weather condtions. The science OGT will be postponed until March 18. Tickets for the boy's sectional basketball game to be played at 6:15 p.m.on Friday, February 28, at Defiance High School, will be on sale during lunch (11:00-12:15) on Thursday, Feb 27, and Friday, Feb 28, in the Auditeria. All after school activities have been cancelled for Tuesday, January 28, 2014. Make up date for the Girls Varsity/JV Basketball game with Miller City, will be 6:00 p.m, Monday, February 10, 2014, at Paulding. All after school activities have been cancelled for Monday, January 27, 2014. The County Spelling Bee has been rescheduled for Thursday, January 30, at 7:00 p.m.
PEVS will also be closed on Wednesday, January 8, 2014, due to the bad road conditions. PEVS will also be closed on Tuesday, January 7, 2014, due to the bad weather conditions. PEVS will be closed on Monday, January 6, 2014, due to the bad weather conditions. 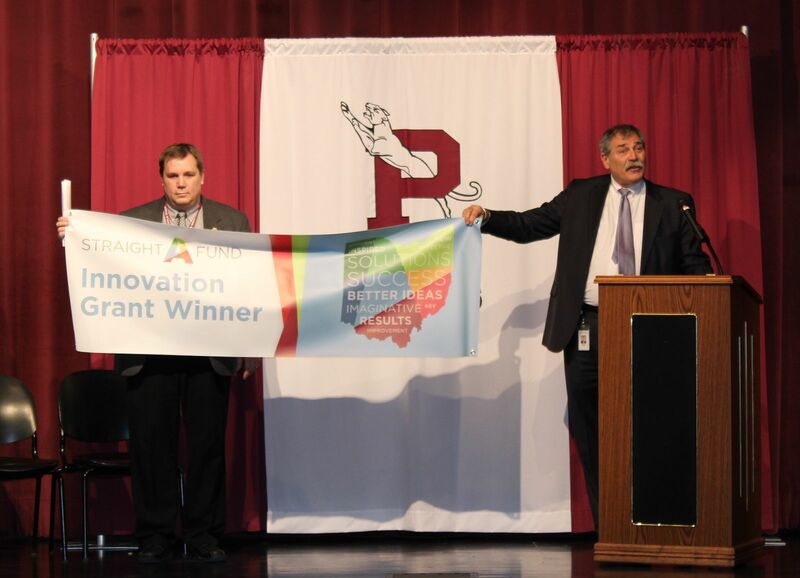 State Superintendent Dr. Richard Ross was in Paulding on Tuesday, December 17, to present the Straight A Fund banner to Grant Winners: Pauldling, Wayne Trace, Crestview and Lincolnview Schools. ACT testing is cancelled. Rescheduled date not determined yet. Mini Panther Basketball is also cancelled. "High Progress School of Honor"! The boys Varsity and JV basketball game against Wayne Trace (scheduled for December 7, 2013) has been postponed until January 14, 2014 due to Wayne Trace's playoff run in football. On behalf of the students, staff, administration, and Board of Education, we would like to THANK YOU for your support on November 5, 2013! Preliminary results indicate the 2.36 mil renewal levy passed by 51%. We appreciate your dedication to the future of Paulding Exempted Village Schools and willingness to help us Continue the Excellence! Paulding Exempted Village Schools has a 2.36 mill renewal levy on the ballot November 5, 2013. NO NEW TAXES!!! Please click here to see a message from the Paulding High School student council regarding the Homecoming activities this weekend. Grades 4 - 8 (from 2012-2013) earned an overall grade of 'A' on the State Report Card! Click here for the Progress Scores. Three teams will be inducted into the Athletic Hall of Fame on Friday, August 30th, 2013. 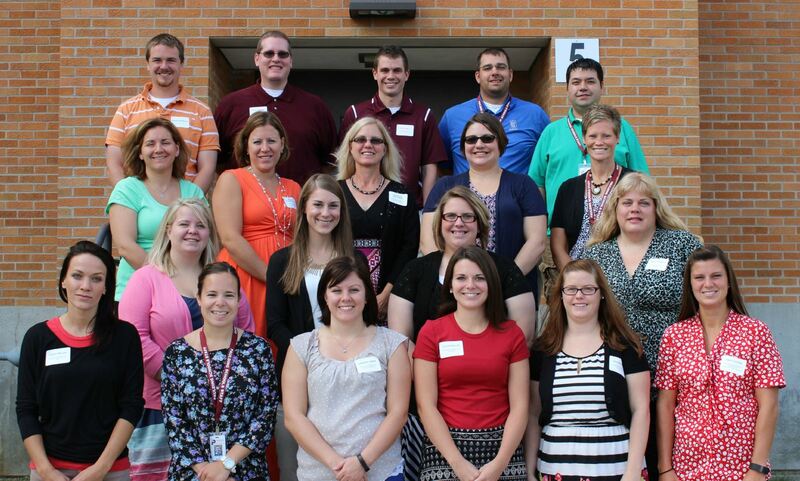 New teachers start the 2013-2014 school year at PEVS. The first day of school is Tuesday, August 20, 2013. School hours are 8:00 a.m. to 3:00 p.m.
Nearly one hundred bicyclist made an overnight stop at Paulding Schools on their 'Across Ohio Bicycle Adventure' (XOBA)! 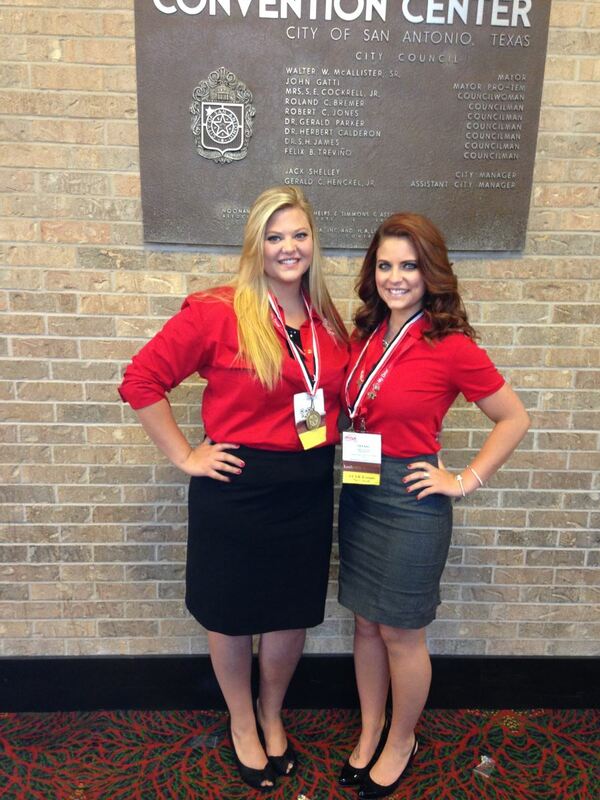 Three Paulding High School students honored with gold medals at the National FCCLA Competition held in Nashville, TN. The regular August Board of Education meeting has been changed from Tuesday, August 20 to Tuesday, August 13, at 7:00 p.m. Please go to the 'Academics' tab at the top to see our newest Academic Hall of Fame members! Korean War Veteran John A. Willitzer received his High School Diploma on May 26, 2013. Paulding High School Art Teacher Sandy Dobbeleare and team placed 3rd in the Zehnder's Snowfest competition in Frankenmuth, MI. Paulding Exempted Village Schools are acccepting nominations for the Academic Hall of Fame. The deadline is February 1, 2013. Please click here for the requirements and nomination form. The safety of our students and staff is a priority. Today we took precautionary measures because of some unusual information brought to our attention. This situation did NOT involve weapons or any direct threats to our school. Local and county law enforcement were called and handled the situation. Evening activities are still scheduled for the High School events. 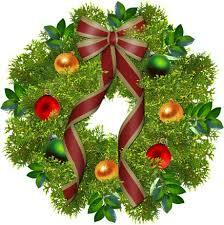 Please click below for an important message regarding the Sandy Hook Elementary School tragedy. 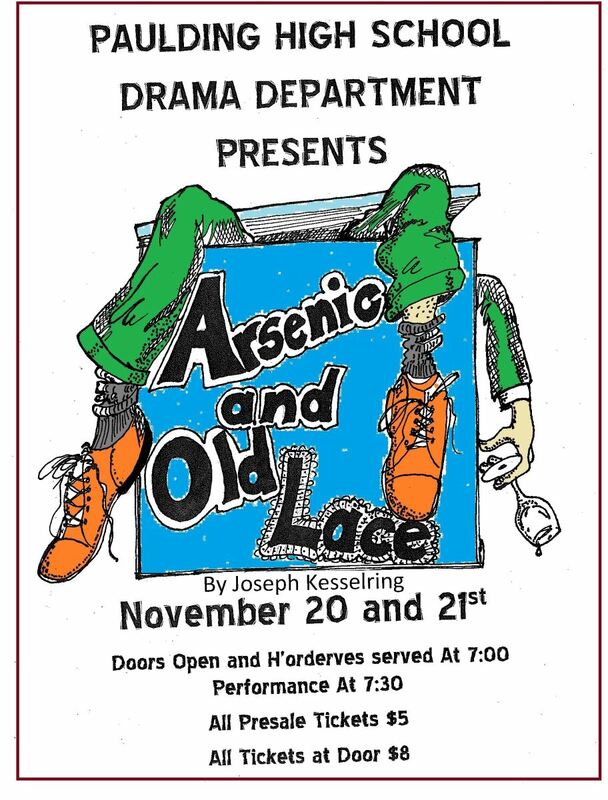 Performance dates are November 16 and 17 at 7:30 p.m..
Panthers vs. Raiders in the 5th Black Swamp Bowl! The building offices are now open for New Student Registration. 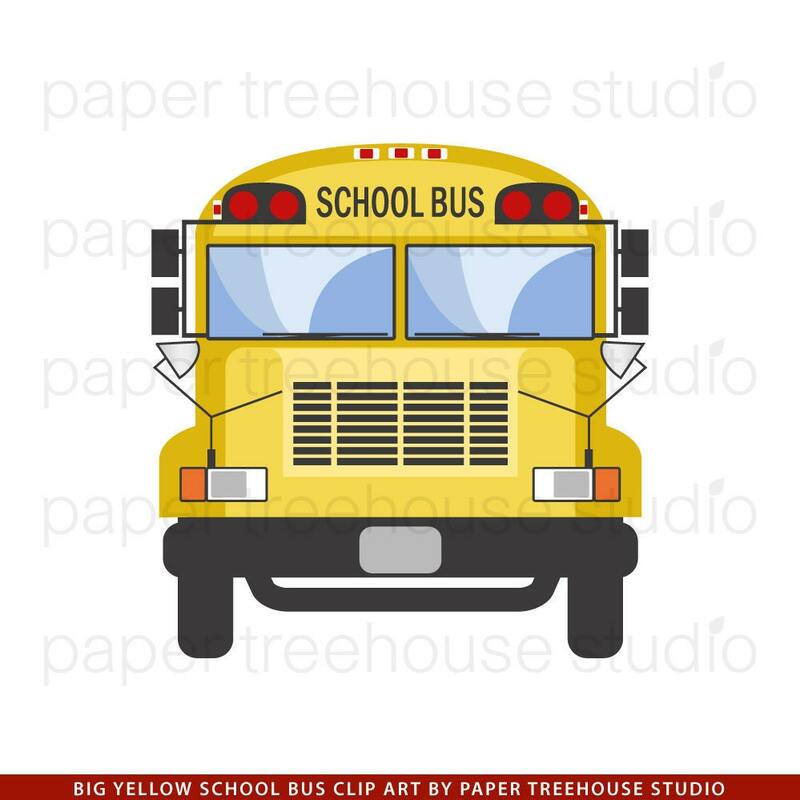 Office hours are 8:00 a.m. - 3:00 p.m.
First round of bus inspections completed on July 31, 2012. Paulding Schools holds a Bike Rodeo! AG IS COOL at the Ohio State Fair! The starting time for the May 22, 2012 Board of Education meeting has been changed to begin at 4:00 p.m. Important Parent meeting regarding plans for the 2013 Jr/Sr Tip to our Nation's Capitol. Nominations for the Academic Hall of Fame are due by February 1, 2012. PHS Art Teacher Sandy Dobbelaere places 1st in the World Class at Zehnder's Snowfest Snow Sculpting competition in Frankenmuth, MI. Click below for more pictures! PEVS is seeking the employment of a new Superintendent. Monday, March 25 was the 6th calamity day for PEVS. The make up date will be Wednesday, May 22, 2013. Retiring staff members for the 2012-2013 school years were honored on May 23, 2013 at the staff appreciation breakfast. Congratulations to our boys varsity basketball team who won the District Semi-Final game against Liberty Center on Thursday evening! The team will play Ottawa Glandorf on Saturday, March 8, at 2:00 p.m. at Bowlling Green State University's Stroh Center for the District Championship. The Paulding High School men's and women's varsity quartets sang the National Anthem for the Championship game of the Div III Girls State basketball tournament at the Schottenstein Center in Columbus on Saturday on March 15. A special early graduation ceremony was held for Paige Ann Sprow, Class of 2014. First day of school is Monday, August 25, 2014. DATE CHANGE: In order to make up instructional time that has been missed due to the weather, the school day will be extended for 30 minutes beginning Monday, March 9, until Monday, May 4, 2015. Since we had a cancellation on March 11, by extending the day on May 4, a total of 19.5 hours or 3 full days will be made up pending no more delays or cancellations. School will be in session each day until 3:30 p.m. Retirees and 30 year employees were recognized at a staff appreciation breakfast on June 2. Retirees: Pat Stevenson, 12 years at PEVS, Autism Teacher;, Diane Erford, 24 years at PEVS, Oakwood 2nd grade Teacher; Karen Schlatter, 36 years at PEVS, Elementary Guidance Counselor;, Nancy Burkley, 30 years at PEVS, Sp. Ed. 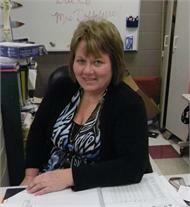 Secretary; Judy Densmore, 34 year at PEVS, Oakwood Teacher's Aide. Not pictured is Ann Kenny, 35 years at PEVS, Oakwood Intervention Specialist. 30 Year Service Awards: Nancy Burkley, Sp. Ed. Secretary; Jerrolyn Parrett, Bus Driver; Jaynne Smiley, MS Art Teacher. The Paulding Exempted Village Schools Board of Education will hold a Special Meeting on Thursday, August 6, at 6:30 a.m. in the Paulding Administration Office, for the purpose of personnel resignations and employment, and to hold an executive session to consider the employment and compensation of public employees or officials. Water Street, in front of the school is now open as is the parking lot between the buildings. Emerald Road, behind the school, is still closed due to the sewer and water construction and Safe Routes to School project. The lots on Emerald Rd can be entered only by coming from the south end of Emerald Rd (Jackson St). The 'Wellness Center' parking lot is NOT accessible yet. Good luck to our PHS Girls Softball team and our PHS Track team as they compete at the District level! 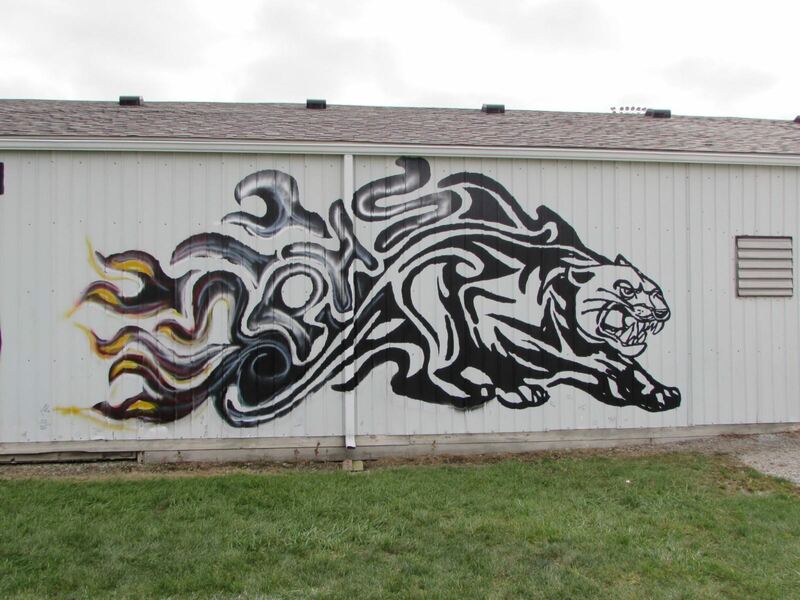 Track team at Ayersville, May 21, start time 11:30 a.m.
Oakwood Elementary 5:30 - 7:00 p.m.
Paulding Elementary 6:00 - 7:30 p.m.
Middle School/High School 6:30 - 8:00 p.m. Thank you for visiting our webpage! Scheduled events may be seen on the 'District Calendar' under the 'Calendar' tab above. Athletic events are listed under the 'Athletic' tab, and menus, lunch account informaiton, Progress Book and other items for parents are listed under the 'Parent Links' tab above. If you don't find what you are looking for, please contact the school at 419-399-4656. Over 50 Oakwood area Veterans and guests were honored by the Oakwood Elementary students and staff on November, 11, 2016. The students, under the direction of Karen Schlatter and Nancy Wehrkamp, sang songs and performed a skit for the Veterans. Friday, March 17, 2017 is an end of the quarter break. School will not be in session. Enjoy the extended weekend! Please note that PEVS will be using Tuesday, April 18 as a make-up day. School will be in session. Free back to school clothing for kids in grades PreK-12! Donations being accepted. Click here for details. The 2017 Athletic Hall of Fame inductions will take place prior to the Paulding vs. Wayne Trace Football Game at approximately 6:10 p.m. on August 25, 2017. Steve Penn, 1962 graduate and the 1983 Varsity Football Team will be inducted. Please click on 'Read More' for more details. The Oakwood and Paulding 5th grade music classes performed as a combined choir (with only one practice the day of the program) at each of their elementary buildings. Paulding 5th grade also ate lunch at Oakwood with their fellow 5th graders. Paulding Elementary students under the guidance of Karen Schlatter, honored our area Veterans on the morning of November 10, 2016. The students sang songs and also performed a skit. 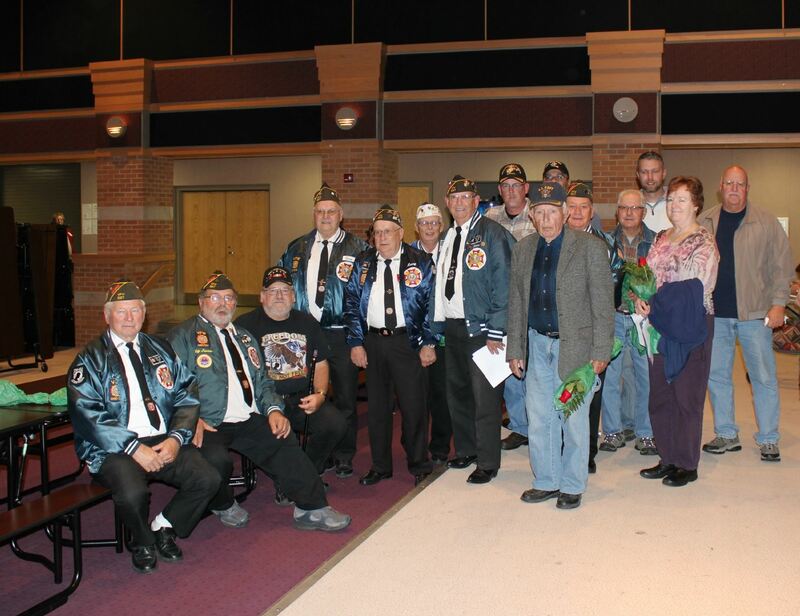 The High School Band and Choir also entertained the Veterans by singing and playing patriotic songs. Physicals for boys and girls will be held on Tuesday, June 21, 2016 at the high school commons area. The cost of the physicals will be $15. Checks need to be made out to the Paulding County Hospital. This is the schedule that will be followed. However, if any student cannot make it during their scheduled time, or would like to come with a sibling, they can come anytime from 8:00 – 11:00 or 12:30 – 3:00. Please bring physical form with you the day of the exam. It can be found on the Athletics Page on the school website or there are copies in the High School and Middle School Offices. Pages 1-2 and pages 5-6 need to be filled out and signed before the exam. The physician will fill out pages 3 and 4 the day of the physical exam. A mandatory College Credit Plus meeting will be held in the auditeria on Monday, February 1, 2016, beginning at 6:00 p.m. for any student in grades 7-12 who is intersted in participating in College Credit Plus classes for the 2016-2017 school year. Students must attend the meeting with a parent or guardian. If you have any questions, please contact the Guidance Office. The Oakwood Elementary 2nd graders presented "Once Upon a Christmas Light" on December 15. The Paulding Elementary 4th grade, under the direction of Mrs. Dawn Sloan, presented their Christmas Program, "Isiah Jones" on December 3rd. 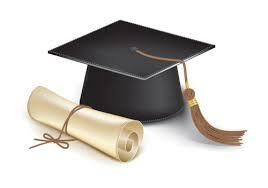 The 8th Grade Graduation ceremony will be held on Monday, June 1st, at 8:30 a.m. in the High School gym. Congratulations to the Girls Varsity Volleyball team who is Northwest Conference Co-Champions with Ada! Both teams finished 7-1 in the conference. Paulding's overall record is 17-5. The Sectional Semi-Final will be played at Paulding on Wednesday, October 21st, beginning at 6:30 p.m. Good luck Panthers!! Click on 'Read more' for names and positions. The Paulding After Prom Parents are sponsoring a Donkey Basketball Game on Tuesday, April 28, at 7:00 p.m. in the HS Gym. Presale tickets will be on sale April 23, 24, 27 and 28 at the school during lunch time for $6.00. Cost at the gate will be $8.00. Call 419-670-2019 with questions. Gametime 6:15 p.m., Thursday, March 12. Click on 'read more' for directions. Money may also be sent to both Elementary's on Thursday morning. 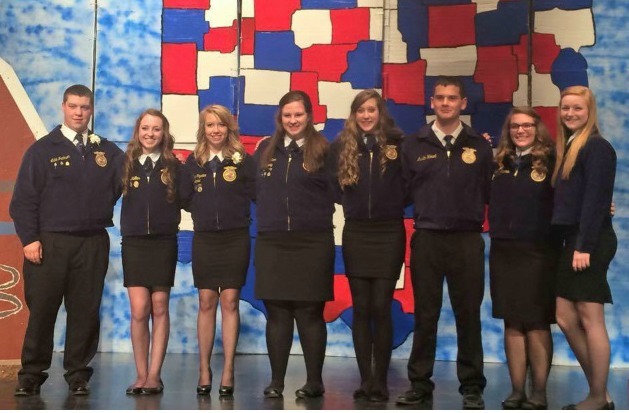 The Paulding FFA members recently competed at the State FFA Convention on May 1st & 2nd. Congratulations to 8th Grader Marcus Miller who came in 3rd place at the Regional Spelling Bee held in Ft. Wayne! PEVS honored staff members that have worked for the district for 30 years. Paulding Middle School brings home 1st Place! Paulding High School brings home 3rd Place! On Thursday, December 20th, a staff member received an email that was concerning. There was no threat to any student or staff member, but in these days of heightened awareness, we decided to lock outside doors to the building as a precaution as we called law enforcement to help evaluate the situation. We did not expect anything to happen, but the safety of students and staff is always a priority. No student or staff member was in danger at any time yesterday. We are always looking for ways to improve safety and have already evaluated our procedures implemented yesterday. Drills are conducted throughout the school year to improve procedures. There is a fine line between under reacting and over reacting, but we will always take precautionary measures to protect the safety of students and staff. The Cooper Family Foundation has generously donated $13,700 towards new Fanuc Robotics teach pendants for the PHS Robotics class. Pictured are Paulding Industrial Technology students, L-R front: Dylan Daniels, Dylan Laney, Devin Elkins, Abigail Leaman, Courtney Luderman, Morgan Mobley, Leigha Egnor, Mrs. Dianne Cooper, and back row: Joseph Shaffer, Colton Howell, Quincy Porter, Will Bulka, Isaac Andrews, and teacher Mr. Roach. Science Olympiad teams qualifiy for state competition again this year! Wednesday, April 3, 2013 will be a Waiver Day for staff safety planning. NO SCHOOL for students. Students at PEVS learn about school bus evacuation. Five Paulding High School students received their State FFA Degree in Columbus on May 3, 2013. The results are in from the State FFA Evaluations. Congratulations to our past and present FFA members! Paulding High School FCCLA members recently attended the FCCLA State Leadership Conference held at the Ohio Exposition Center in Columbus, Ohio. Paulding Middle School and High School held a Veteran's Day Program to honor our local veterans. Please click on 'read more' to see pictures. Paulding Elementary is doing a book swap to promote summer reading. Click on 'Read more' to see more pictures. Paulding Middle and High School: 6:30-8:00 p.m. The first day of school is Thursday, August 20. Congratulations to the PHS Softball team - Divsion III DISTRICT CHAMPIONS! The team will now play against Archbold in the Regional semi-final at Findlay High School on Wednesday, May 25, at 5:00 p.m.
Paulding High School Drama Department presents, Meredith Wilson's 'The Music Man'. This production is a musical comedy has been entertaining audiences since 1957 and is a family-friendly story to be shared with every generation. The After Prom parents are hosting a fun and exciting evening of Donkey Basketball on Tuesday, April 12, beginning at 7:00 p.m. in the high school gym. Presale tickets are $6 and will be sold during lunch on 4/8, 4/11, and 4/12 in the High School and at Oakwood Elementary. Tickets are $8 at the door. The September 13, 2016 Board of Education meeting has been changed to September 20, 2016, 7:00 p.m. in the Administration office. PEVS held a breakfast for our district Senior Citizens on December 9. The High School and Jr. High Choirs and Bands performed Christmas music, along with the Paulding Elementary 4th Grade, while members of the NHS and Student Council served the breakfast catered by Grant's Catering. Thank you to those who were able to attend! Click on 'Read more' for more pictures. 1st Place-Jacob Davis, 2nd Place-Jasmine Wong, 3rd Place-Zara Goetschius. These 3 students are in the 8th Grade. Paulding Elementary held thier Night of the Arts on April 11. Many master pieces created by the students were on display. 5th Grade display - "The Dragon"
Congratulations to PHS Senior Estee Miller who was named First Runner Up and Miss Congeniality in the Van Wert Peony Pageant. The Peony Festival will be held June 2-4, 2017. Congratulations to Simeon Shepherd (gd 12) and Bailey Manz (gd 10), who competed at the Regional Cross Country Meet in Tiffin on October 29, 2016. The boys did not qualify for state competion, but we are very proud of them for their accomplishments! The NOCAC (Northwest Ohio Community Action Commision) will be providing FREE lunches and activites at LaFountain Park (Lincoln St, Paulding, by the pool) from June 6 through August 11, for ages 1-18. Three PHS Track members qualified for Regional action in Pole Vaulting. 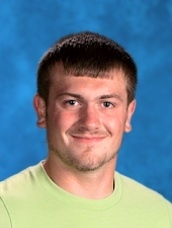 Brendon Lothamer will be competing Wednesday, May 25 at Tiffin High School, beginning at 4:00 p.m.
Jacee Harwell and JoEllyn Salinas will compete on Friday, May 27, at Tiffin also, beginning at 5:00 p.m.
GOODLUCK to our PHS Student Athletes! Click on "Read More" for pictures. PEVS Retirees and staff reaching 30 Years of Service were recognized at the annual Staff Appreication Breakfast held on May 25, 2016. Congratulations to 8th grader Jacob Deisler (L) for winning the District Geography Bee and to Trace McKinley (R), runner up. Click on 'Read more' to see all the contestants. Paulding Elementary held their annual Spelling Bee on December 4. Congratulations to the winners! Haley Manz was the Champion, Jacob Martinez was 1st Runner up and Katie Beckman and Madison Verfaillie tied for 2nd Runner up. Haley will compete at the County Spelling Bee at Payne Elementary on February 4, 2016. Click on 'Read more' for pictures. A mini-relay was held at PEVS on May 26, 2015. Students enjoyed the afternoon by walking the track and playing games. All donations will go to the American Cancer Society. Thank you to all the volunteers who helped make this event possible! Please click here for the 2015-2016 Preschool Screening schedule. Programs on Wednesday, November 11.
program at Paulding will start at 1:30 p.m. in the auditeria, with cookies and punch. Attention all district residents 60 and older! to our annual Senior Citizen's Breakfast on Wednesday, December 9, 2015, beginning at 8:30 a.m. in the Auditeria. Join us for breakfast, fellowship and entertainment. Doors will open at 8:15. Please RSVP to 419-399-4656, ext 1512. Jerome Schottenstein Center. GOOD LUCK ADAM! 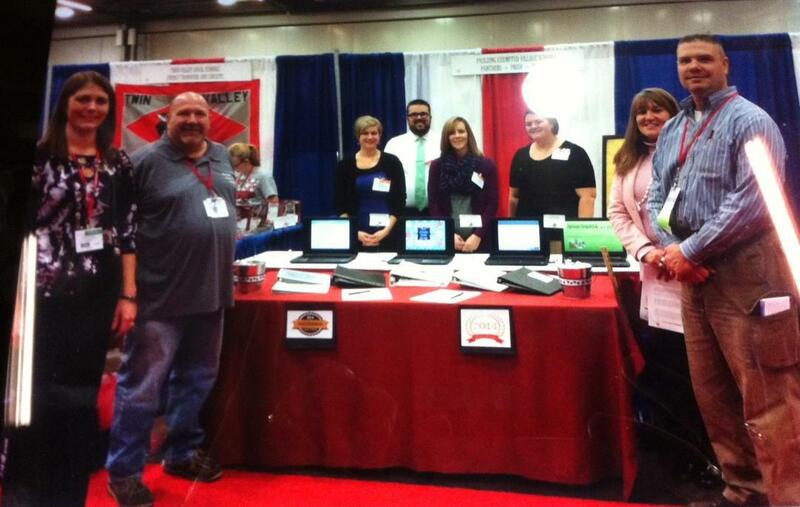 Paulding Elementary teachers Casey Homier, Ryan Malcolm, Jessica Fohnher and Kelly Hauter (L-R in background) showcased our school at OSBA (Ohio School Board Association) Conference in Columbus. Also attending the conference were Treasurer, Maria Rellinger, Board member Greg Reinhart, Paulding Elementary Principal Stephanie Tear and Board member Jim Foltz. PHS Science Olympiad teams place at the State competition on Saturday, April 26. Congratulations to our PHS Boys Varsity Basketball team for a great season! Click HERE for the School supply list for Paulding Elementary, Oakwood Elementary and Paulding Middle School. FFA Members compete at the District 1 Invitational. Christmas Break December 22-January 3. PHS winners of the House Cup, Vinco Vici Victum, earn trip to Cedar Point. Free Community Child Screenings for ages Birth to 5 years. Please click here for more information. Seven PHS students recently attended Ohio Leadership Institute's Summer Leadership Training Camp. This is a global leadership camp held at Ohio Dominican University and is designed to enhance and expand global leadership skills. FCCLA Regional Rally held at Ft. Recovery. Congratulations to our Science Olympiad Teams who came home from State with medals! The High School and Middle School Science Olympiad teams competed at the Regional level at Defiance College on March 1, 2014. The Middle School team earned a second place finish and the High School team a seventh place finish. Both teams will compete at the State Science Olympiad in April! The PEVS Mini-Relay for Life will be held on Friday, May 23, from 12:00 - 2:45 p.m. at the HS Track. Paulding Exempted Village Schools would like to send our most heartfelt condolences to the Smith Family after hearing of Randall's passing early Saturday morning, July 18, 2015. Randall Smith was a 2007 graduate of Paulding High School. 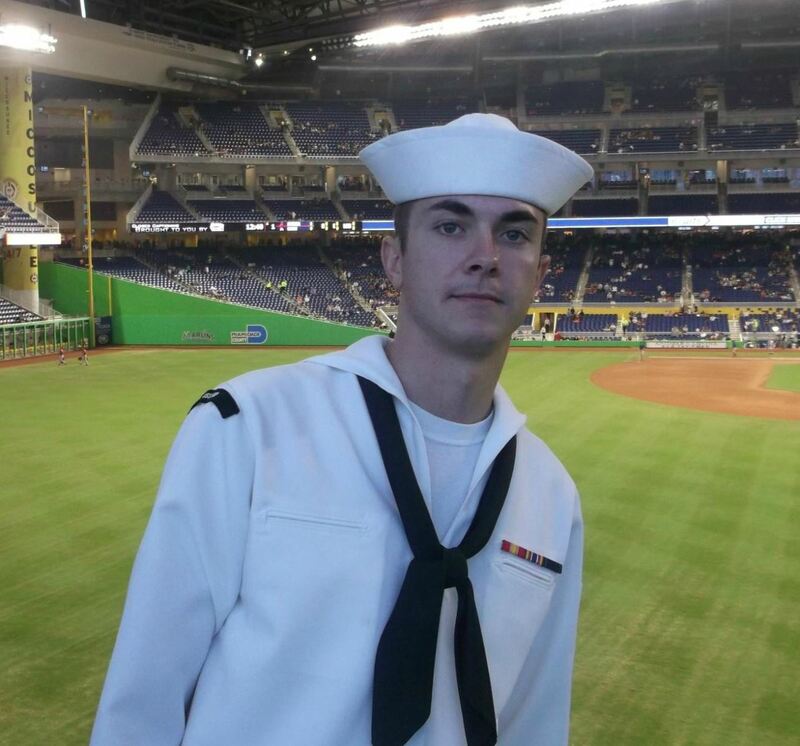 He joined the U.S. Navy after injuring his shoulder playing baseball at Defiance College. He recently re-enlisted and was transferred to Chattanooga, TN serving as a logistics specialist. It is reported that Smith saw the shooter and warned people around him, according to family members, but he was unable to get away. He sustained gunshot wounds during the domestic terrorist attack on Thursday, July 16, at the Navy Operations Support Center in Chattanooga. Randall is survived by his mother and father, his wife Angie, and three young daughters. Please keep the Smith Family in your thoughts and prayers along with the four families of the marines who were also killed. God's grace to all of them for their service for our freedom! A memorial service will be held Saturday, August 1st at 11:00 a.m. in the High School Gym. Paulding High School Science students competed on May 16th at Ohio State University. The students won many individual awards as well as the prestigious Harold C. Shaw Award for outstanding team. Only eight high schools in Ohio were awarded this trophy! PEVS held their Mini-Relay for Life on Friday, May 20th. It was a beautiful day for everyone to get together to fight this dreadful disease. Congratulations to our 8th grade girls Volleyball team who were Northwest Conference Tournament Champions and the Western Division Champs! The team finished with a 16-2 record. Paulding High School FCCLA members recently competed at the Regional Star Event Competition at Penta Career Center. Lonna Saylor, Haleigh Stallbaum and Leona Alred each received a silver medal for their projects. Three new members were inducted into the PEVS Academic Hall of Fame on Sunday, May 28, 2017, at the commencement ceremony. New members are L-R, Richard Rosalez-Class of 1994, Dr. Wendell Spangler-Class of 1992, and Jeffrey Webb-Class of 1997. The following employees were recognized for thier retirement from PEVS at the annual staff breakfast on May 25. Science Fair students (High School and Middle School) win award for the school with the most Superior ratings at the District Science Fair! Most of these students will be competing at the state level on May 13. Front L-R: Cade McGarvey, Baylee March, Jalynn Parrett, Preston Ingol, Jordyn Merriman, Kaylee Tressler and Hailey Wwidenhamer. Back L-R: Hunter Kauser, Sadie Estle, Preston Johanns and advisors, Mrs. Favorito and Mrs. Johnson. 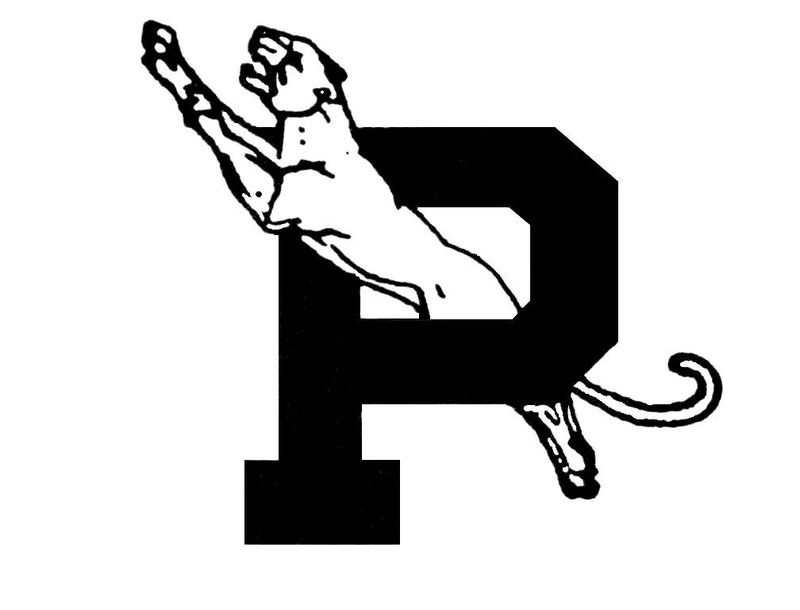 The PHS Girls Softball team was named Sectional Champions after defeating Delphos Jefferson on May 13. The team will play in the District Final at Lima Bath on May 20 against Allen East. Paulding Exempted Village Schools is hereby giving notice that sealed bids for the 2016 Window Replacement Project at Paulding High School and Paulding Elementary School, 405 N. Water St., Paulding, OH 45879, will be accepted until 12:00 Noon on June 6, 2016, at the Paulding Exempted Village School District, 405 N. Water St., Paulding, OH. A set of project documents may be obtained from the Paulding Exempted Village School District Office at 405 N. Water St., Paulding, OH 45879. The Board reserves the right to accept any part or all of any bid and to reject any and all or parts of any and all bids. The Paulding Science Olympiad teams competed at the State Science Olympiad competition held at The Ohio State University in Columbus on Saturday, April 11, 2015. The Division B team placed 28th and the Division C team placed 29th overall. UPDATE: As of May 20, the last day of school for students will now be Monday, June 1st, with the exception of the Seniors, who will not have to return after their Graduation on May 24. The Preschool Staff at PEVS recently completed CPR training. 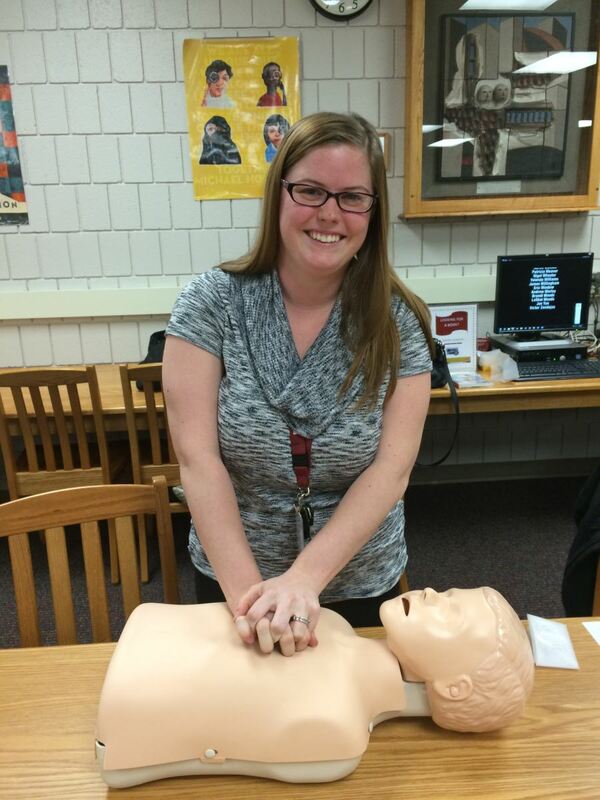 Oakwood Preschool teacher, Briana Ripke is shown here practicing chest compressions. Several students qualified for the State Science Day, which will be held Saturday, May 10, at The Ohio State University. Students qualify for the District Science Fair at Ohio Northern on March 22! The Paulding Exempted Village Schools Board of Education recently hired William Hanak as the new Superintendent to take over for the 2013-2014 school year. Three former PHS grads inducted into the Academic Hall of Fame. Congratulations to Beth Norbeck (Speech & Language Pathologist) and Shelley Shinners (Preschool Teacher), for serving Paulding Exempted Village Schools for 30 years! Both ladies teach at Oakwood Elementary. Congratulations to Brian Gorrell - Class of 1994, Ken Manz - Class of 1969, and Tom Manz - Class of 1990, for being inducted into the 2018 Academic Hall of Fame. Click here for more information. Paulding Mini Flag Football registration forms are available for grades 3-6. Please click here for the form with details. The Paulding Athletic Boosters are currently raising funds to construct a new Press Box at the Athletic Complex. Congratulations to our PHS Band and Choir members who attended Solo & Ensemble on February 1. Click here for individual results. 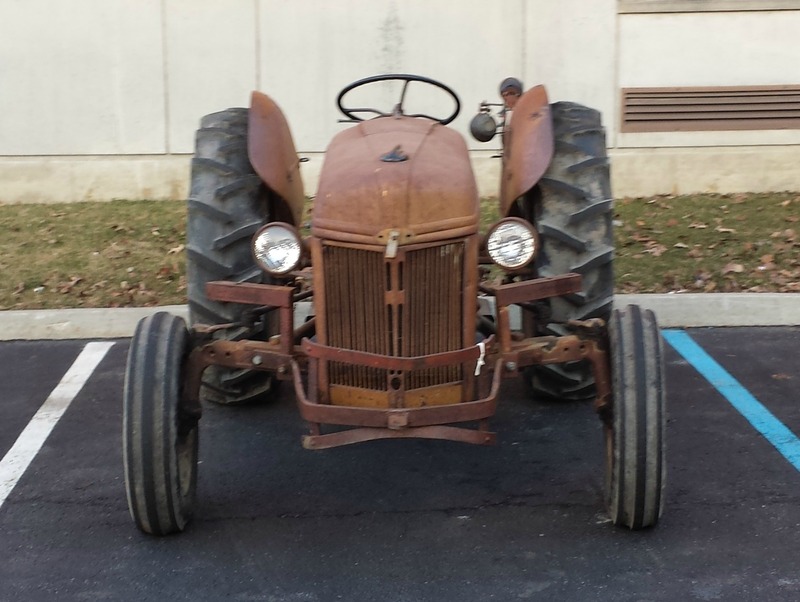 Many FFA members braved the cooler weather on March 27 and came to school by tractor on 'Drive Your Tractor to School' Day. Did you know students lose anywhere from 2 to 3 months of the math they learned over summer break?!? Check out this FREE math program that is proven to reverse learning loss over the summer! Please click on 'Read More' for the link and an informational video. The PHS Concert band received a Superior rating at the recent State OMEA (Ohio Music Education Association) contest. They were the only band on their stage to earn 2 superiors from 3 judges that evening! Go Band! Click on 'Read more' to see pictures. The 8th grade team "Proud Panthers" provided and filled Christmas stockings for soldiers with items such as sunblock, puzzle books and assorted food items. The stockings will be sent to soldiers serving overseas. The 'Stocking for Soldiers' is sponsored by Den Herder Funeral Home. Five PEVS students qualified for the May 14th State Science Fair at The Ohio State Universtiy, by earning Superior ratings at the distrcit competition. Five Middle School students earned Superior ratings at the District Science Fair held at ONU on March 18. These students will move on the the State Science Fair in May. L-R: Sadie Estle, Molly Adams, Baylee March, Jalynn Parrett, & Hunter Kauser. Jalynn also won the Audubon Award and Environmental Science Award, and Hunter won the Naval Science Award. These employees were recognized at the annual staff breakfast on May 25 for 30 years of service at PEVS. L-R: Patty Carlise, Joanie Goyings, Mark Stuck, Brenda Troyer, Mark Rhodes, Cheryl Schier and Pat Keezer. Paulding Engineering Varsity team won the first place trophy at the T.E.A.M.s competition at Ohio Northern. More than 30 teams participated in the Varsity division. Registration for the Panther Youth Volleyball Camp is now open. The camp is July 24-26 for 4th through 8th graders. Please click here for the registration form. The PHS Quiz Bowl team has made it to the quarterfinals of the NBC24 Academic Challenge Tournament. Competing for Paulding from left to right: Madison Good, Emma McMaster, Travis Couts, and William Deisler. The tournament will continue on March 18. PHS Senior Jarrett Sitton has signed a letter of intent to play football for The University of Findlay. Good luck Jarrett! 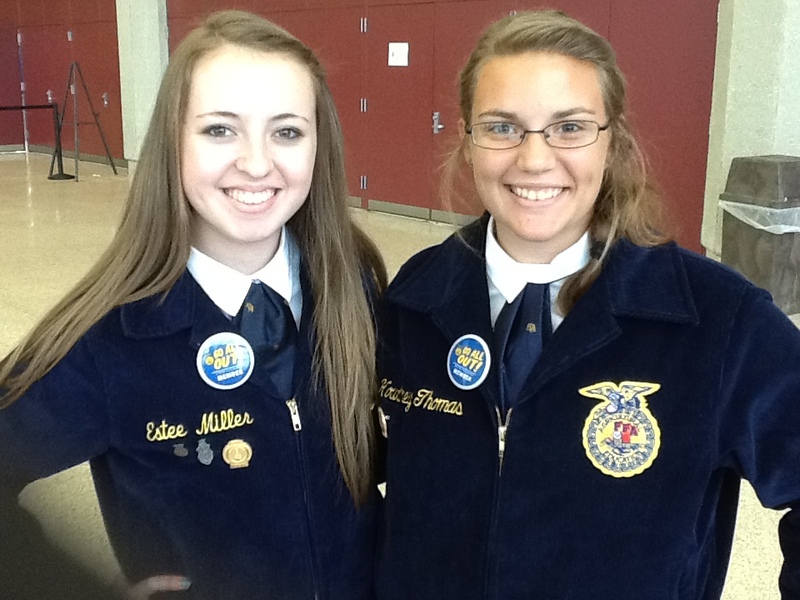 Several Paulding FFA members attended the State Convention in Columbus April 30-May 1. Some of the members were recognized for their outstanding achievements, and FFA Advisor, Mr. Brett Foster, was also recognized. Paulding High School athletes have been visiting elementary classrooms to stress how important reading is and to promote "Reading is a Sport". Shown here is Jarrett Sitton and Samantha Meggison, reading to Mrs. Deisler's first grade class. The Defiance WalMart selected Oakwood Elementary to be the recipient of its Teacher Rewards. WalMart representatives Courtney and Renee brought twenty $50 gift cards to be given to teachers whose names were drawn from a basket. The Oakwood PTO decided to add an additional seven $50 gift cards making every teacher a winner!! The Defiance WalMart also donated a cart load of school supplies for students at Oakwood Elementary. After drawing names for the gift cards, Courtney and Renee served cake and punch to all OE staff members. Students helped make this a special event for their teachers by providing at great deal of cheering as names were announced! They enjoyed tootsie pop suckers for their role in the surprise program on Friday (10-09) afternoon. 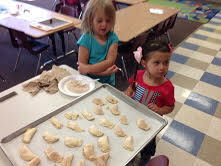 Elena and Lizzy from Mrs. Taylor's Preschool class helped make apple turnovers for a snack during their Apple Unit. The PHS Drama department presented Chitty Chitty Bang Bang on March 20 and 21. Please click on 'read more' to see more pictures. Congratulations to Senior TAYLOR DEATRICK for being named NWC Wrestler of the Year, and varsity wrestling coach TONY GONZALES for being named NWC Coach of the Year! 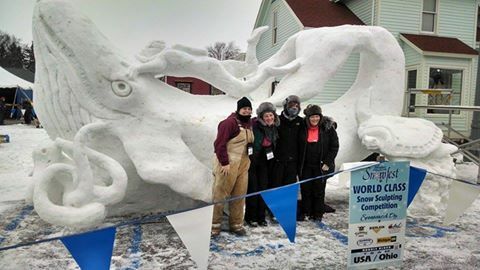 High School Art Teacher Sandy Dobbeleare and her team competed in the snow sculpting competiion in Frankenmuth, MI. Congratulations and GOOD LUCK to 8th grader Marcus Miller, for winning the Paulding County Spelling Bee! He will participate in the Regional Spelling Bee on March 8 in Ft. Wayne. Paulding Exempted Village Schools has earned the top rating of Excellent with Distinction! The Northwest Ohio Community Action Commission (NOCAC) will be hosting a Summer Food Program again this summer. This Program provdies FREE Lunches and Activities for children ages 1-18. Click here for Paulding details and here for Oakwood details. Kalyn Strahley was elected as the State FFA Treasurer for 2018-2019 year at the 90th Annual Ohio FFA State Convention. This is a huge accomplishment as she competed against 55 other FFA members from around the State. It has been over 25 years since Paulding has had a member elected to State Office. The Paulding FFA Chapter is so proud of her!! 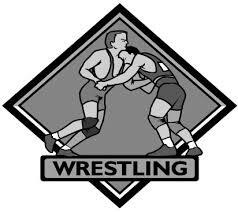 Congratulations to Coach Gonzales, Coach Mead and the Paulding High School wrestling team as they won the Northwest Conference wrestling championship on February 1, 2014! Also, Taylor, Deatrick, Aaron Mock and Dakota Valdez were individual champions. This is our second straight NWC wrestling championship. Congratulations to bus driver Mike Mericle, who received the George Sontag, Jr Award for School Bus Driver of the Year. Mike accepted the award at the Ohio Association for Pupil Transportation conference in Columbus on March 16, 2015.
at the Regional Rally held at Van Wert High School. First grade students at Paulding Elementary are learning about "Neighbors In Need." 105.7 The Bull, asked students to help fill our local food pantries with non-perishable food items. Donations will be accepted until November 6. 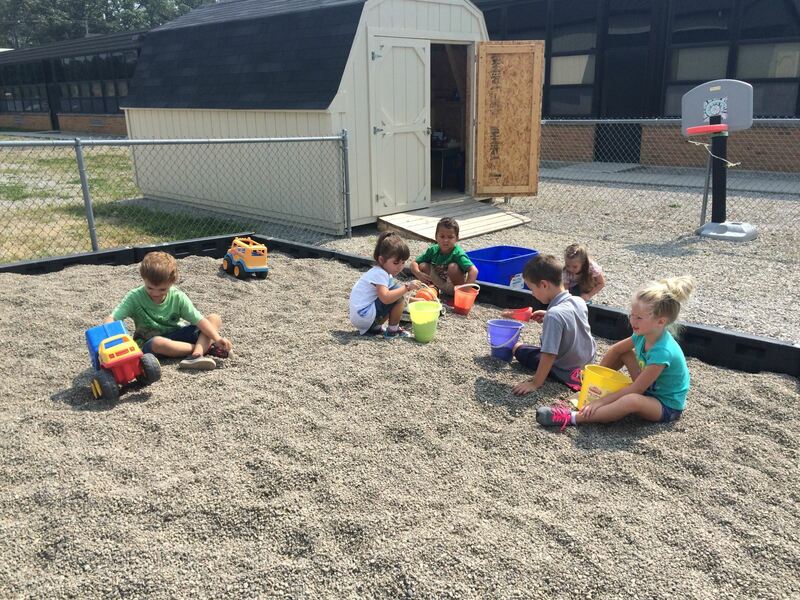 The preschoolers at Paulding Elementary School have been enjoying their new digging box on the preschool playground. 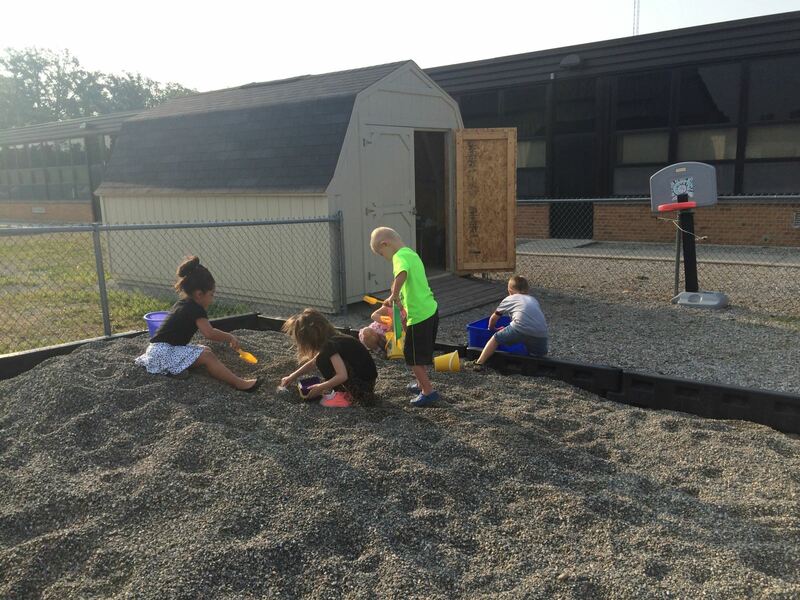 The digging box was made possible by those who supported the elementary school cookie dough fund raiser. Shown in these picture are preschoolers from Mrs. Kohart's classes. Normally during Homecoming week, HS Art Teacher, Mrs. Dobbeleare, takes students to the football field area to paint the street. With all the construction in town this year, the street was too busy, so the painting was moved to the concession stand. Click on 'Read more' to see more pictures. Students from Paulding Middle School participated in the 1st annual Paulding Middle School Service Learning Day on Friday, October 9. All 6th, 7th, and 8th Grade students were involved in two service learning opportunities- at the Paulding Schools campus in the morning and around the Paulding Community in the afternoon. In the picture below, Paulding Middle School 7th Graders are removing stone around the fence at the Paulding Skate Park. Left to Right: Luke Jackson-Vice President, Estee Miller-Secretary, Paige Fitzwater-Presidnet, Hannah Farr-Treasurer, Chantal Monnier-Reporter, Austin Howell-Student Advisor, Kourtney Thomas-Chaplin, and Katlynn Fuller-Sentinel. The last scheduled day of school for students is Tuesday, May 24, 2016. Congratulations to the Paulding High School Varsity and JV Quiz Bowl teams, who won the Northwest Conference Quiz Bowl Tournament held on November 14 at Delphos Jefferson High School. PHS Senior Corbin Edwards has signed a letter of intent to continue his baseball and academic careers at Defiance College. Corbin is shown here with his parents Greig and Cindy Edwards, and coaches Ben Barton and Travis McGarvey. Paulding Elementary would like to give a big shout out, and THANK YOU to Defiance College students for donating plastic caps collected from their recycling program. Show with the Defiance College students are Paulding Elementary third graders from left: Mara Phlipot, Makayla Carr, Addison Shull, Dominik Batt, and Dakota Gerdemann. Are you ready to share your AMERICA? Host an Exchange Student!!!!! Left: 1st Place Cade McGarvey--Junior: qualified for the International Science Fair which will be held in Los Angels in May. Cade will be competing against the top 2000 HS students in the world. Right: 2nd picture: Senior District Science fair qualifiers: Left to right, Chantal Monnier, Preston Johanns (5th place), Preston Ingol. Student's from Mrs. Warncke's Spanish class suprised the PHS student body on Valentines Day when they came to school that morning. EVERY locker in the HS had a paper heart taped to it with the phrase "You are Loved" written on it. Only 655 schools in the United States qualified for National Rankings. The PHS Varsity team was ranked 27th out of every school in the United States that qualified, regardless of division! Please click here for team pictures. PHS Senior Damon Egnor signed a letter of intent to play baseball at Bowling Green State University. Seated (L to R) Rob Egnor, Damon Egnor, Candi Egnor. Standing (L to R) Coaches: Randy Bachman, (River Bandits) Matt Hodge, Ben Barton (Paulding). Congratulations Damon and good luck! Both Oakwood and Paulding held Veteran's Day Programs for our local men and women that served or are currently serving our Country, on Wednesday, November 11. Congratulations go to the Paulding Concert Band for qualifying for OMEA state concert band contest. Our band gave a truly outstanding performance at the District Contest earning them straight superior ratings from all 4 judges. In fact, they were the only band at our location to achieve such an impressive score over the 2 day event. Additionally, this makes them a 3 time state qualifier in 4 attempts; a record not held since the 1970's when the band was under the leadership of the legendary Ernie Burnett. The 1964-65 Boys Basketball Team and Ashleigh Stallkamp. (L-R) Sandy Adams Parrish, Gerry Gillen, Denny Holtsberry for Linda Holtsberry, Lou Roth for Ron Roth, Jim Rosselet, Jack Suman, Chuck Utterback, Ashleigh Stallkamp, Jim Riley, Mrs. Follis, Dave Penn, Sam Hatcher-MC, Bob Mott, Bob Miller, Sherry Jackson for Jim Jackson, Dorothy Flaugh for Tim Hunter, Jim Cox, John Bissell, and Gene Baughman. Saturday, March 14, Paulding High School and Middle School students competed at the District Science Day at Ohio Northern University. The High School students won the team award for most Superiors and qualified ten students for State Science Day which will be held in May at Ohio State. An Anonymous Bullyling Report has been added to our website under the 'Parent Links' tab. Please use this link to report any forms of bullying toward a student. Paulding High School and Middle School students compete and place at the Regional Science Fair held at Northwest State Community College on February 28. Paulding High School Art Teacher, Sandy Dobbeleare, competed in the annual Frankenmuth, MI snow sculpting contest for the 12th year in a row. Mrs. Dobbeleare and her team of former students Aly Miunger and Emily Theilbar, and senior Jake Long, started carving the 21' X 10' X 10' block of snow on Monday, January 19, and finished on Saturday, January 24, with not much sleep. The team placed 4th in their division! Click on 'Read More' to see more pictures. 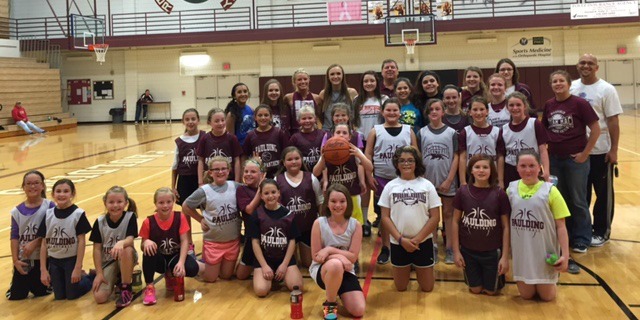 Girls in grades 4-6 had the opportunity to learn basketball fundamentals along with having some fun during a week long basketball camp. High school coaches and players did a great job of teaching and coaching the future Paulding Panthers. The girls will be playing in vaious leagues and tournaments throughout the winter. Students in Mrs. Bok's science class test water cohesion and surface tension. PHS Senior Jaycie Varner has signed a letter of intent to play Volleyball at Rio Grande University in Rio Grande, OH. Jaycie is seated with her parents and Head Volleyball Coach, Josh Early. Good Luck Jaycie! The Paulding Science Olympiad teams participated in the Northwest Ohio Regional Science Olympiad competition on Saturday, March 19th at BGSU. Schools from Allen, Defiance, Fulton, Hancock, Hardin, Henry, Lucas, Marion, Ottawa, Paulding, Putnam, Sandusky, Seneca, Van Wert, Wood, Williams, and Wyandot counties vied for the top four spots and a chance to move on to the State competition. Both the Paulding High School and Paulding Middle School teams placed 4th overall and both qualified for State Competition in April at OSU in Columbus. Paulding Middle and High School students partiicpated at the Regional Science Fair at Northwest State Community College on Saturday, February 27. Congratulations to our Science Olympiad teams who competed in the Regional Science Olympiad competition held Saturday, February 28th at B.G.S.U. The Division B team captured the second place trophy! Both Division B and Division C ranked high enough to qualify for the State Science Olympiad competition to be held at OSU in Columbus in April. The Junior Class Parents are again organizing this year's After Prom. Meetings are held on the first and thrid Mondays of the month in the Commons/Auditeria. Junior parents are encouraged to attend. Donations are being collected to cover After Prom expenses. If you have not been contacted yet and are interested in donating, please contact Becky Ringler at 419-258-0267 or send your donation check payable to Paulding High School After Prom, to the school, attention Becky Ringler, 405 N. Water St., Paulding, OH 45879. Congratulations to Shana Manz, Paulding Middle School 8th grader and Sam Woods, Oakwood Elementary 5th grader, for being the winner and runner-up respectivlely, of the 2015 Geography Bee. Shana also qualified to compete at the STATE level on March 27th! Congratulations also to the other grade level winners. (Click on 'Read more' to see picture). Sam Woods, runner-up, Shana Manz, winner. Paulding Elementary School was named a School of Promise and a High Progress School of Honor by the Ohio Department of Education. Click here to read the letter from Richard Ross, State Superintendent of Public Instruction. 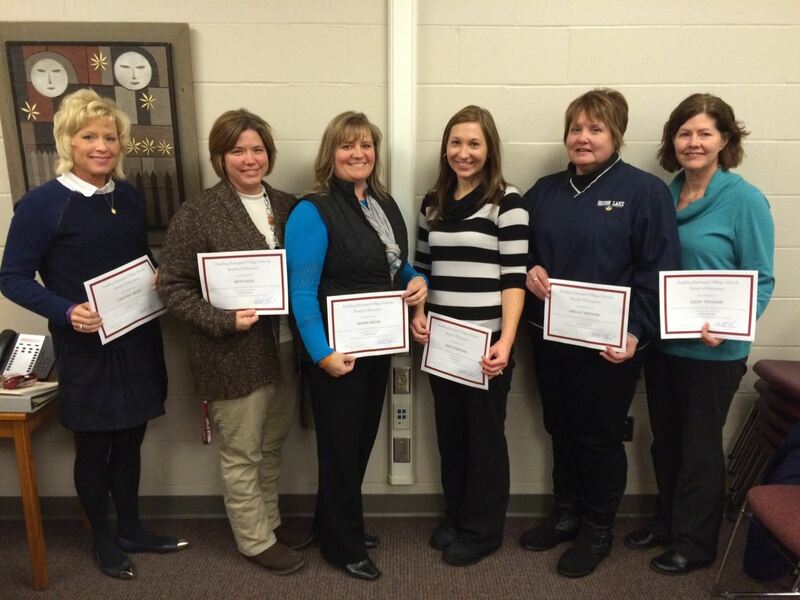 Six PEVS teachers were recognized at the November 18, 2014 Board Meeting for meeting the requirements needed to become a Master Teacher. (L-R) Caroline Arend, Beth Kelly, Deedi Miller, Erin Schroeder, Shelley Shinners and Ellen Williams. Congratulations!